I was pretty active with blogging and new found interest on craftwork but sudden throat tightness over a night keeps me away sometime. I was uncertain what is happening with my throat but I was feeling difficult and sleepless night and it even continued through the day where I was going through the sensation of vomiting and was normal only by next night after doses of antibiotic. From the time I was confined to bed for more than a month when I had my femur facture in 2013 I’m going through some difficult at night, related to throat, before I get into slumber. This time I’m certain that it was perhaps the effect of air con’s cold breeze, since the temperature started to raise our usage of AC has been increased slightly at night. I believe it is the brand that we chose for AC has been an issue lately. Until we used LG for last 8 years, the device was in our control and it made the entire room cool and only after an hour and some it would feel chilly. But the Samsung AC blows cold air and it feels chilly in 10-15 minutes and once switched off the coldness goes away immediately. It wasn’t the case with us now; we have a Samsung AC already and it used to be like that. So when we shifted home we put it into my brother’s room and we settled for old LG, and when the blower goes off last year we had no option but to go for a second’s blower and that moment Samsung was available and we quite forget about the way it blows and got stuck now. Even one of my uncles has a Samsung AC and they complaints same. I would say it not air con but air cooler, and I will not recommend this to anyone. An air con should be cosy, but just being compact (Samsung) it gives trouble in other ways. Though back to normal, the air con threats me now and going to sleep under its cold wrap make me wonder what impact it hold for next night! Lol Btw. I have couple of photos to show u the house I was making with Popsicle sticks and here it was incomplete. I plan to do some painting after working on roof. 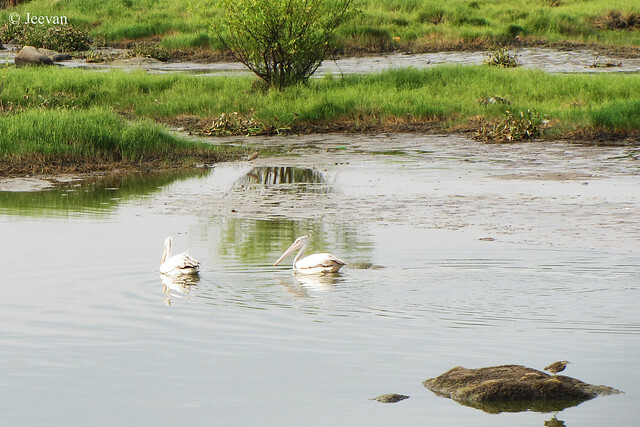 The couple of pelicans in the photos below were shot at the backwaters of Kovalam, about 30 km from here on the ECR. Pelicans are among the many birds visit this backwater area and the ones that supposed to be migratory birds has been spotted no matter what the season was. 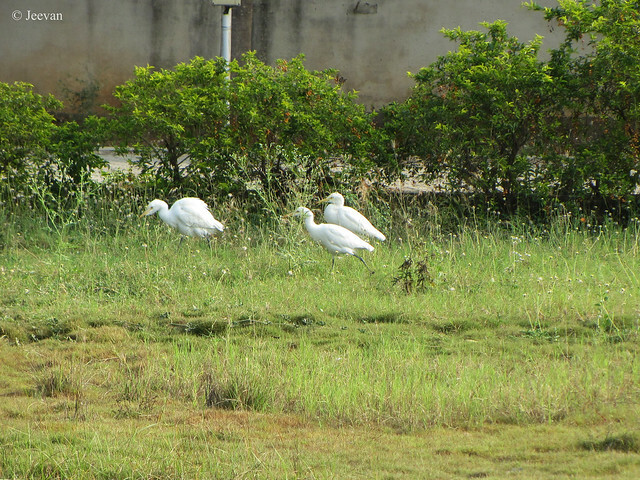 I have seen pelicans, painted storks and other water birds like pond heron, little cormorants, egrets… during many a time I crossed the backwaters on ECR. 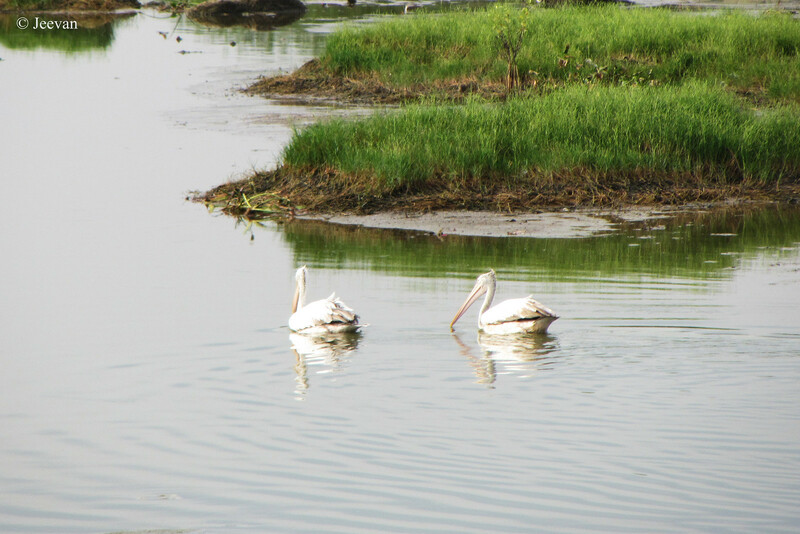 The pelicans that were shot from a bridge across the backwater channel on the road led to Fisher-mans cove are spot-billed or grey pelicans. The birds of large inland and coastal waters breed in southern Asia from southern Pakistan across India to east Indonesia. 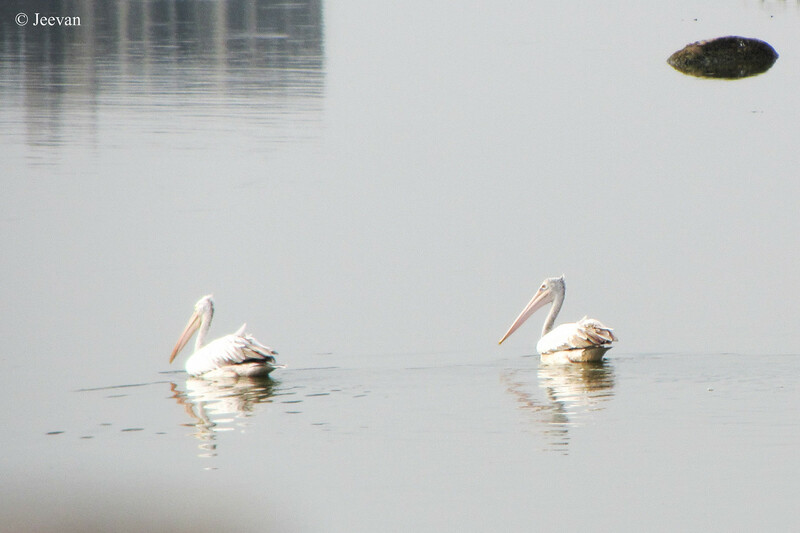 At the distance they are difficult to differentiate from other pelicans in the region although it is smaller the spots on the upper mandible, the lack of bright colors and the greyer plumage are distinctive at closer look. Kovalam aka Covelong is a fishing village and holds a beautiful curvy beach, which has lately become a favourite spot for water sports and activities esp. surf! Kovalam has a surf school and conduct international surf competitions and many young fishermen from the village has transformed to surfers. Last month I went to Elliot’s Beach couple of times in my new powered wheelchair right from the home. First time I was accompanied by my uncle and cousin and later with my uncle, it feels wonderful taking advantage of the powered wheelchair with more power than the older and riding all the way to the beach on my own. Though I was accompanied by my uncle, there’s so much difference in the way watching the beach (or visiting any other place) from the cabin of a car and wind boring open landscape. It’s been long time I took on the promenade of Elliot’s Beach and moving on the pavement in tiles was caressing taking along the cool breeze from the Bay of Bengal. 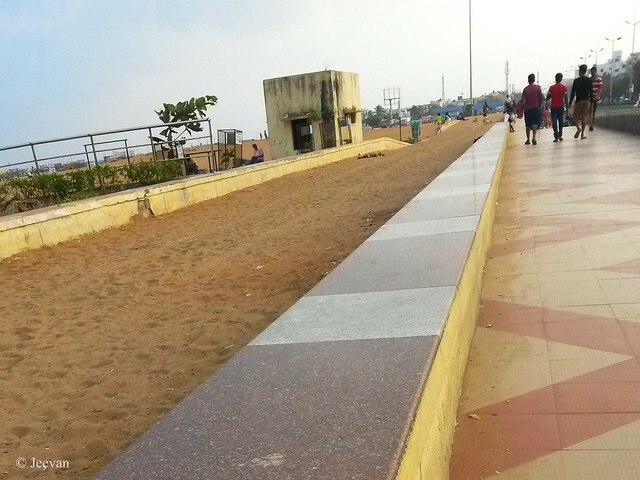 I went there in the evening between 4 and 6 to keep away from the road traffic and rather going on main roads I take some narrow streets to reach 4th and 5th avenues and move into the promenade near Urur Olcott Kuppam. Only from that side one could climb into the promenade where it slides to road surface. It’s really disappointing to see there’s no ramp facility to climb that one step that separates the road and pavement. Other day we went earlier and the sun wasn’t settled down and sharply hitting the forehead, so we halted near the police booth where the sun was blocked by the KFC restaurant on the opposite side. There I find a silver fence or rail making a neat presence along the small space of green devote to the beautification of beach, but except the bougainvillea in red and white all are withered. But what really bothered or make me feel disgust was the stray dogs that were lying here and there (you could see one lying on the sand in the above image) and causing menace to the public visiting the beach. I won’t have minded if they were looking good but they were all lookalike expose to some severe skin disease and infectious. I am not against stray dogs, and there are enough stray dogs in my neighborhood and not all are threatening, but the once with rashes and skins disease could cause trouble and also affect other healthy dogs. Wish the authorities take some step in controlling stray dogs or removing the ones in bad state to some rescue centers that could treat them and left free somewhere. 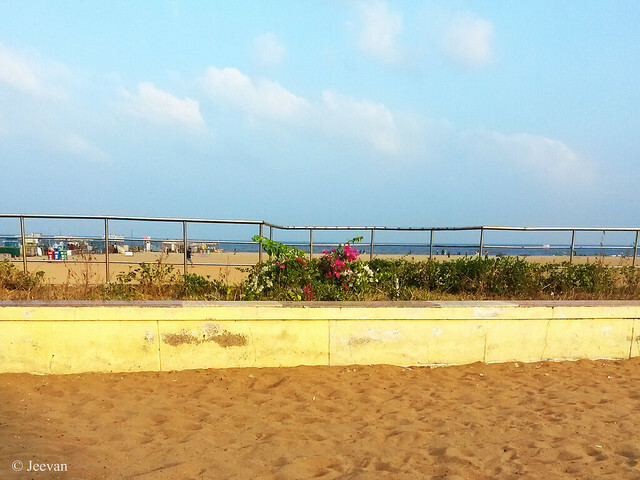 For those unaware about Elliot’s Beach in Besant Nagar, Chennai, it is the second most visited place in Chennai next to the world famous and second longest beach in world, Marina Beach. The Elliot’s beach is about 2 km from my home and this is the first time I making it through powered wheelchair. Summer hasn’t existed quite yet, but the temperature has risen to the warmth of mid-summer season. Yesterday has been the worst day with maximum temperature (about 37°C in Chennai) of the month, we experienced a sleepless night with sudden inoperative of air con. I wasn’t in need of AC until couple of weeks back but the situation is too bad for this early stage of summer. Even with two fans at swirl we couldn’t tolerate the muggy inside the room and with all windows closed, due to mosquito menace, it feels unaired. Glad the AC service man attended us in morning, made sure the machine works properly gives a sigh of relief and hope of good sleep tonight. I am going through some inexpressive frustration in life dealing with relationships and inability to change certain things. I was perplex with things happening around me and relationship with others make me feel disdain, as if things are pursued with an intention. I could somehow guess whether it is good or bad temper looking into their faces esp. the eyes convey so much, but I continue to act like nothing happening because it is not easy to lose a relationship although they deny or act like approving. While things being like that I find interest on something to keep me busy and away from laptop and frustration sometime. 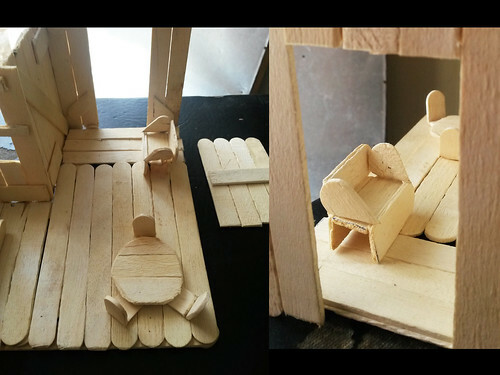 I am involved in craftwork for last few days on my own interest and hooked to do things with Popsicle sticks. Right now I execute a sort of farm house on my own planning and designing. Though I have begun with a simple home, I planned to do interesting things of my favourite in coming days rather going behind regular items. My grandmother was helping me last few days, cutting Popsicle sticks in whatever shapes I needed, before she go back to her home. After grandfather’s demise on December 31st, she didn’t move out of her home for last two months due to some rituals and only last week she came home to stay with us for few days. Glad she is doing well now and come out of the grief of grandfather and started to practice with stride. 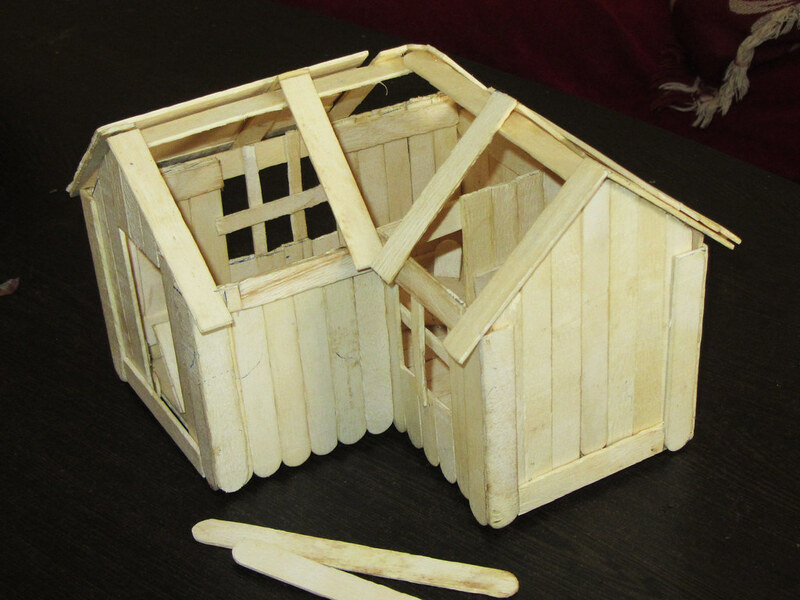 In her absence I feel like broken hand as I have to ask mom or dad to cut Popsicle stick to build my house. My grandmother being skilful in craftwork (remember her rework on this) doesn’t need a mention about her aid and it only enhances my interest. I want to complete the house before she visits me next week and hope she guides me. Cats are annoyed for those who have pet dogs that don’t socialize easily! 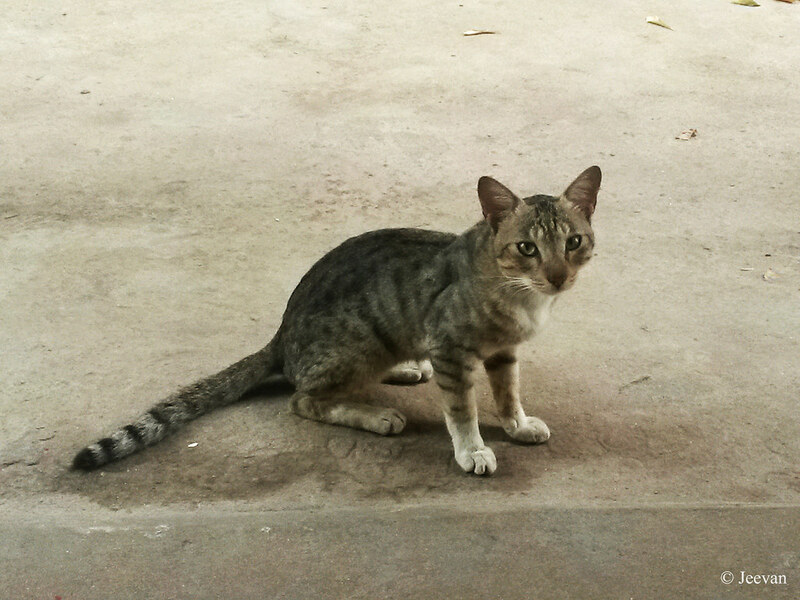 And here’s a cute domestic cat, and among the many in the neighborhood, this is one silent being and brave enough to come close with person. 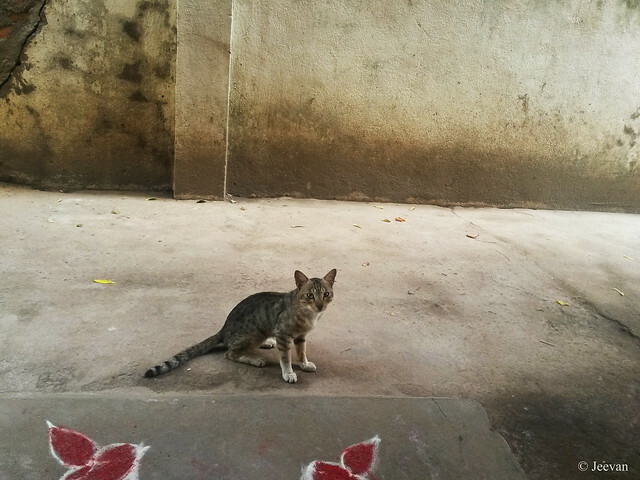 The cat was walking past our courtyard one morning and I made a noise as inviting her and she reciprocated and come stood in front of the doorway. I plead her a minute and went in and came out with the mobile and she waited patiently and gave me neat poses while I negotiate with her. I truly amazed at the way she respond to my noise and negotiation! Belong to the category of domestic or house cats; I learn they are all members of one species (Felis catus) and have a very long relationship with humans. Cats are believed to be domesticated as early as 4000 years ago by the Ancient Egyptians to control plentiful rodents, as cats are skilled in killing them. 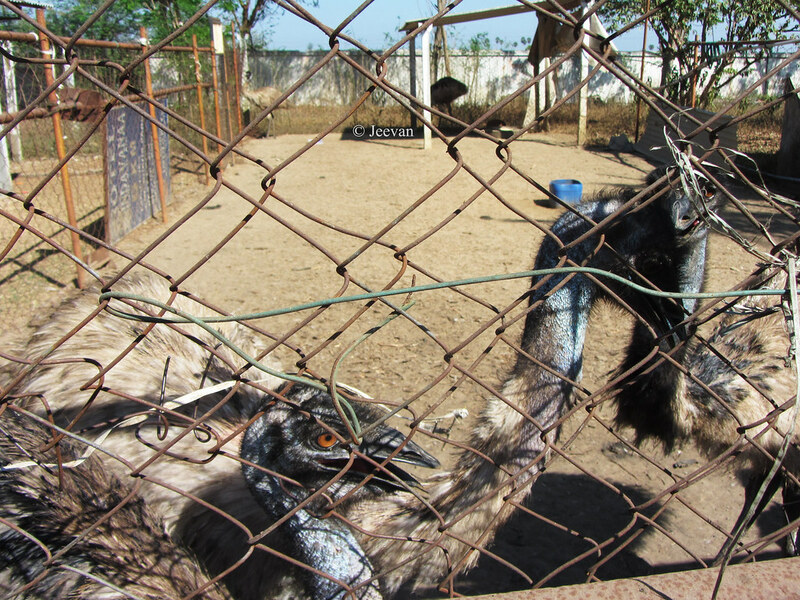 But perhaps they should have first earned the affectionate attention of humans. Early Egyptians worshiped a cat goddess and even mummified their beloved pets for their journey to the next world. Marigold is a common name in English, derived from Mary’s gold, and it was taken from the fact that early Christians placed flowers instead of coins on Mary’s altar as an offering. 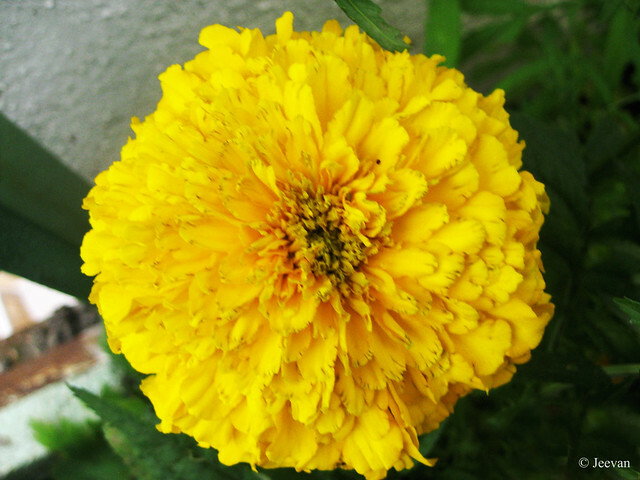 Marigold is often used in festivities honoring Mary. 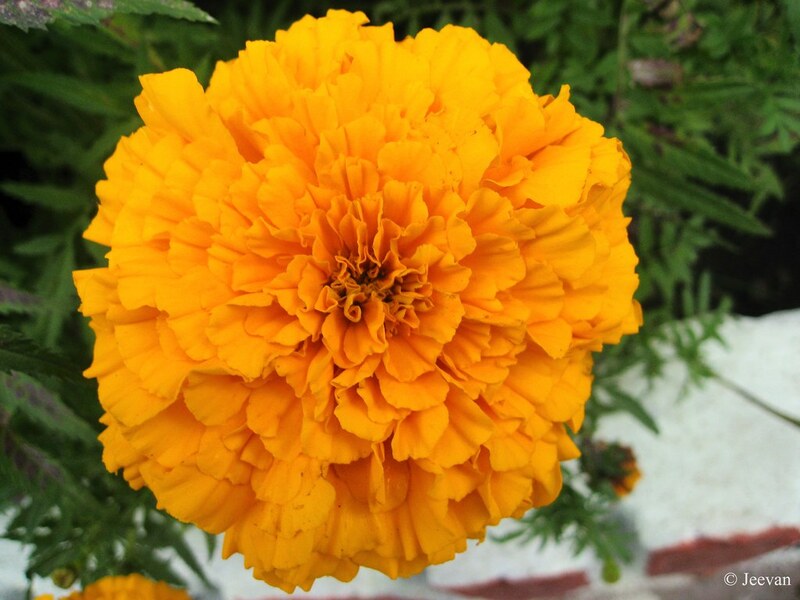 In Nepalese culture, marigold plays a significant role where marigold garlands are used almost in every household, esp. during the Tihar festival (similar to Diwali) and it is also sold in the markets for daily worships and rituals. Marigold, rooted to North and South America blooms naturally around the world in colors of golden, orange, yellow and white, often with maroon highlights. 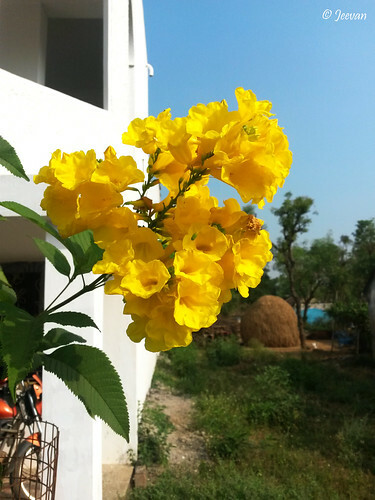 The The orange and yellow marigold here was shot at Kodaikanal during one of the visits. Mornings are meant to be fresh and traveling during that time would be optimum. And my travel from Ariyalur to Kumbakonam was appropriate with the mood and the activities of morning caught my attention. I could see so many students riding in bicycle to school and most of them were girls. All where pedaling standard bicycles that was given by the state government for free of cost. It was wonderful to see them, cycling in uniform in a line or two, leaving no hindrance to the freeway and utilizing the benefit of government in right way. The free bicycles were provided to all govt. and govt. aided high school students, from very long time, but who utilize the most were the students in rural – with schools at distant. I know some people who have resold their free bicycles (not only cycles, but many freebies) but seeing these students using things to the fullest make feel same. I believe not everyone is in need of freebies and people have better things than the government supplied and the govt. has to realized this and make certain the freebies are given to people who deserve. And by doing so, the taxation could be reduced or utilized for other essential. On our way we come across many villages with cafes transformed into mini hotels at the morning hours, providing basic cuisine like hot Idlis, Vada, Dosa etc… and at one place someone transferred a plate full of steaming Idlis from their home to their little shop outside left us with desire. But as we were heading for the temple town (Kumbakonam) with an intention of taking holy dip at the Mahamaham tank, parents hesitate to eat at those outlets as mostly aren’t pure veg! Glad we could find a moderate mess at a village town close to Kumbakonam and parcelled the breakfast and moved out and settled on a by lane aside a dry channel before entering the town. The preparation for the big day (Mahamaham) was in full swing then and many parking’s were created along the way and about 6 or 7 km away from the Mahamaham tank and we couldn’t access right into the town, but was forced to take the specific routes designed for the Mahamaham festival. I put on navigation on the Google maps pointing at Mahamaham tank before entering the town and many indications were also kept alongside the roads directing to the tank. But at a distance of 2 km, the road marked as leading to temple, was blocked and was asked to cover the distance by walk leaving the car somewhere. The weather was hot and walking through it (in bare footed) put pause among others. But we decide to move further to find any other route and as expected the Google maps showed me an alternate way that passes through little streets. I also noticed the distance gets lesser as we move further on the route and at last found a parking lot with a distance less than a km to the tank. Leaving me at the car along with my dad, others went to take dip in the Mahamaham tank and later my cousin returned, taking some quick dips in few wells (yes, there are about 20 wells inside the tank and the water level was sustained to knee) to send my father to partake. As time passes into noon, the weather become hotter and we couldn’t sit inside the car without switched on to AC. There wasn’t a thing to provide shelter and all cars are parked under scorching sun opposite to a big marriage hall. The people kept arriving and outgoing on all major roads leading to the tank and to my surprise my family returned to the parking lot in an hour and some! I heard from them that people are allowed to enter the tank from one back and exit on the other. Though the tank was crowded it wasn’t complaint but the temples around them have queue that extends for a km kept them away. Going to Kumbakonam and coming out without pictures of a temple and so make disappointing, but I didn’t get a chance to prove it was a temple town. Perhaps I could visit Kumbakonam at any other time in future as that wasn’t the right moment to explore the town and no one could make a way rather designed by the police department. I could see ample police all over the town and many cops were brought from faraway districts like Thirunelveli and more than 15 gates where created for the Mahamaham to control the crowd. It was estimated as more than 1 million people have taken holy dip at the Mahamaham tank on the Mahamaham day – Feb 22, 2016. 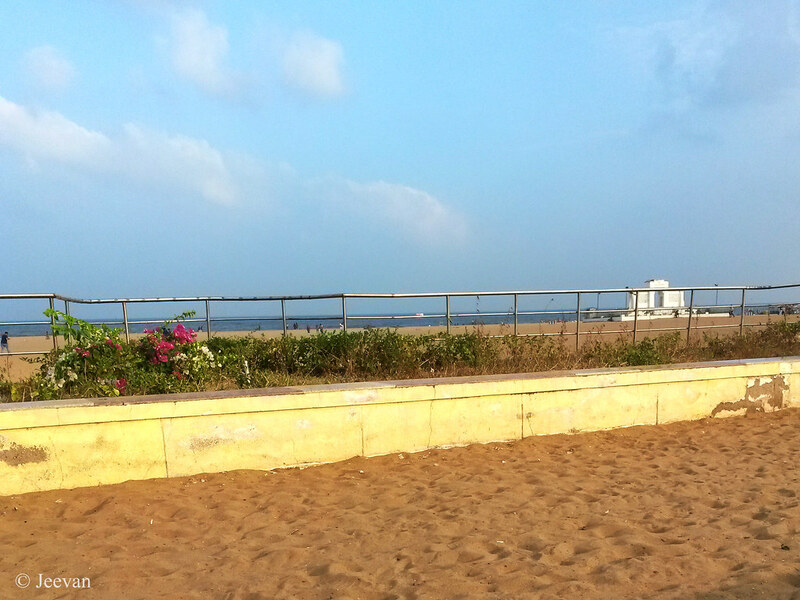 On our way back to home, we took ECR (east coast road) via Sirkazhi, Chidambaram and Pondicherry. The roads were pretty fine except going through many curves and speed breakers creating mild difficulty, but the scenes on this road make forget those. Near Kollidam (between Sirkazhi and Chidambaram), we come across rows of shops selling handcrafts made of bamboos. Though we were into late afternoon, we couldn’t stop anywhere to take leisure photos and also on this road we are pleased by the sights of some pretty green fields making vast carpets of green. One of the many shops that sell bamboo handicrafts near Kollidam (Sirkazhi), on ECR. 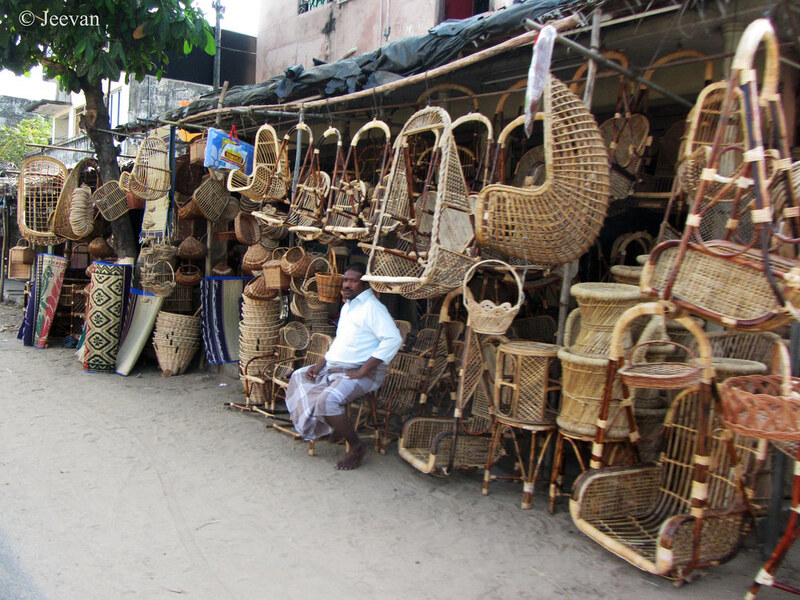 The shops sell mostly basket swing chairs, rocking easy chairs, stools and fruit baskets all made of bamboos. We had our lunch at Sirkazhi and I went for tamarind rice unlike others who went for meals. It was something I could not forget, because what I ate was tasted as my favourite Puliyotharai which is given in temples. It was a small pure veg. restaurant on the street of Vaitheeswaran Koil – a well-known Hindu temple for palm leaf astrology and the Lord Shiva here is referred as god of healing. We parked the car in front of the hotel and they served me a plate of tamarind rice at my seat. I ever had Puliyotharai as my entire lunch and I could still recollection the flavor and the desire for it continue to exist. We had our evening coffee and snacks at Pondicherry and continue to drive on scenic road, but it doesn’t look scenic anymore as it was on its transformation from state to national highway. Ever like before we witnessed number of vehicles coming on the opposite side of the road which perhaps heading to Mahamaham! 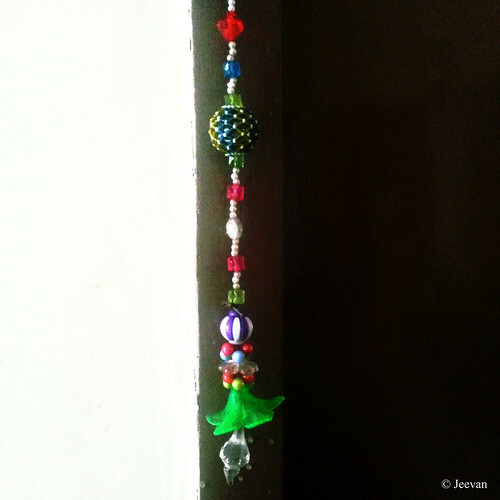 A festoon made of colorful beads. During a tour to Gujarat, my grandmother bought this wall ornament but it was ripped later and she herself reworked on it. I watched the Tamil action drama, Pichaikkaran, from the drive-in on Wed. evening and it is a movie based on the life of a millionaire, who turned down his richness for a time period to save his mother’s life. Arul Selvakumar is a MBA graduate, flew down to India to take charge of his mother’s spinning mills. But within a short span in office his mother met an accident and falls into coma. With no response to any of the treatments, a sage guides him to beg for 48 days with a condition to not to use his influence in anyways and begin each day with bare hands, to get back her mother. The affectionate son decides to go through the term in belief of saving his mother and what all he faces during this course remains the topic. Actor and music director Vijay Antony played the man behind the subject. Though he couldn’t adapt quite into the look and attitude of a beggar or perhaps the subject doesn’t need it, has given his best in acting and do stunning actions. He carries the look of smart and intelligence throughout the film, reminding his previous roles as Salim. Debuted Satna Titus as his love interest, exhibits elegant acting and the places where she reveals he’s a beggar and the hesitation in practicing with him later were all done in pretty manner. And of course she’s beautiful! Already there’s a movie released in Tamil based on beggars. Yes, Bala’s Naan Kadavul had dealt with the subject but were treated with brutal. The beggars here were shown with little dignity and expressed intelligence, perhaps because the plot was set in metropolitan – Chennai. The movie has some merry scenes esp. the perspective on economics by a beggar gets great applauds at theater, and make certain entertainment. The background score was good and with each drag on the title (pichaiiiikkkkaran) upraise. According to director Sasi, the film was an inspiration from the real life story of a millionaire he knows, who would beg for 6 months annually and look after his job the remaining months. Though he didn’t put forth any fact about him, but has done his best communicating the lifestyle of beggars and the public’s perception on them. Particularly this scene where Vijay Antony express annoy when a police handshake him when come to know he’s a millionaire, but who was knocked early in beggar veil. It was a nice execution distinguishes the differences in society. Pichaikkaran – is a social messenger through entertainment. Waking up early in the morning in Ariyalur was something feels fresh, perhaps the new environment holds the magic and moreover the peaceful ambiance, although the guesthouse we stayed exists adjoining an important junction on the bypass with Lorries passing frequently, doesn’t discourse the mood. 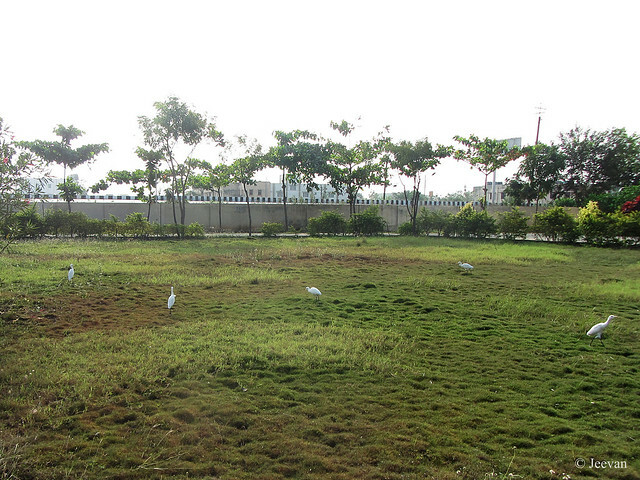 The guesthouse has a large garden and unmaintained lawn in the front yard with a pavement to come around. But as soon we arrived the previous night, I decided to explore the garden next day morning before we move to Kumbakonam. The night was cool over there; though we were offered AC rooms, the need for air con doesn’t become certain and we chilled out sometime before hitting the bed. The rooms allotted for us were spacious, and the lobby itself as sizeable of a hall. We experienced quietness staying there and we the only guests of the house doesn’t expose to any restrictions. In morning we saw many little egrets on the lawn which seems to come in foraging and their presence really made the morning more pleasure and also represents as small statues décor the garden. 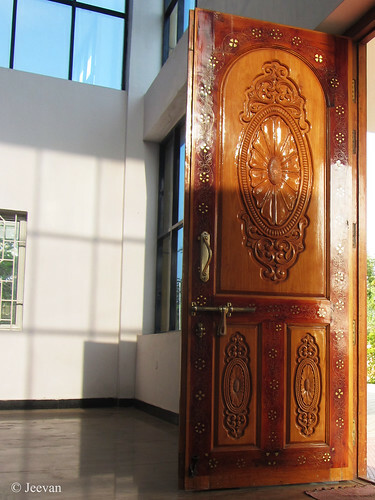 The guesthouse has some beautiful shrubs (including flowering ones) on both sides of the entrance and the doors also etched some lovely designs that includes floral in bronze. The lobby has reflection panels on all sides above the lintel and for the windows, which keeps away the need for a mirror. 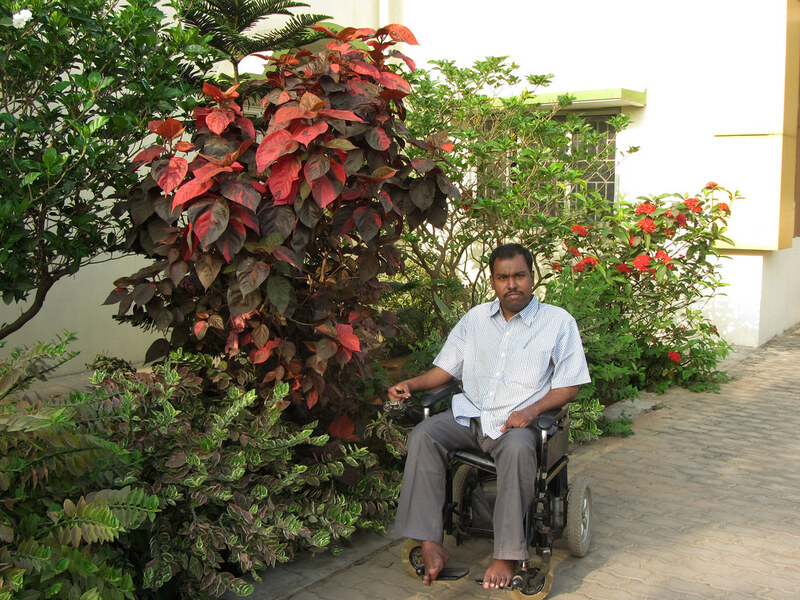 I find the shrubs outside the guesthouse presents a nice background to photograph and I pushed myself to place between them for a portrait to feel content. My father said Ariyalur was surrounded by Cement factories and the popular ones like Arasu, Ramco and Dalmia where among them. And thus it was always busy with lorry traffic and even at night they kept moving on. 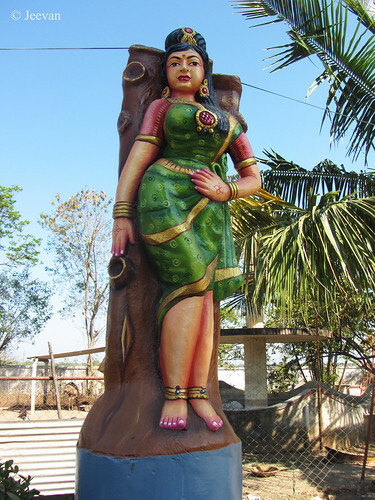 Ariyalur has no places of interest particularly to mention or I unaware, but the renowned Chola temple Gangaikonda Cholapuram comes under the district of Airyalur. Built by Rajendra Chola I in 1035 AD, the temple modelled similar to the Big Temple in Thanjavur and it’s one of the most visited places in Tamil Nadu. I really want to visit Gangaikonda Cholapuram for very long time and last year they commemorated 1000th year of Rajendra Chola formally ascended the throne in 1014 CE. I really miss visiting the place just been to the district, and no proper planning keeps me away from the destination. We leaved the guesthouse by 8am and moved towards Kumbakonam with a plan of having breakfast on the way. As usual google maps guided us on the short route and the road was good enough but many Lorries passed the way. With no big towns on the route, we settled for a mine hotels/mess adjoining villages and to say the truth it tasted good that high paid restaurants. The hot idly, vada, sambar and chuttni were fulfilling. 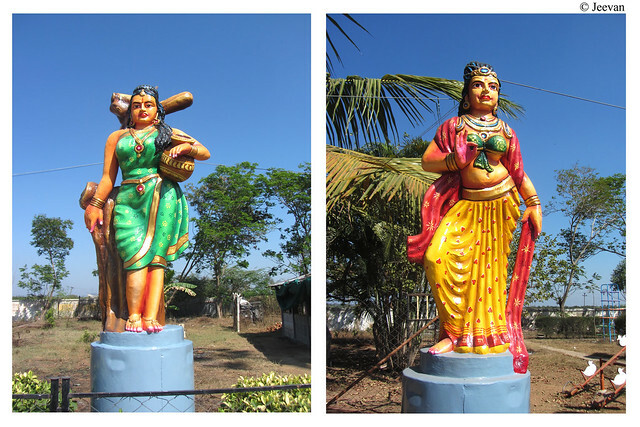 Ariyalur is a town in south India and the district capital of same; and it was departed from the Perambalur district, during the former government period. Ever been to Ariyalur, I was depended on Google’s maps for the route and I was directed to the destination via Tittagudi instead going to Perambalur, which is 20km circuitous but take lesser time to reach. Being a fan of state highways and lover of countryside roads, I enjoyed the opportunity of traveling this route with beautiful sightseen of villages and fields. 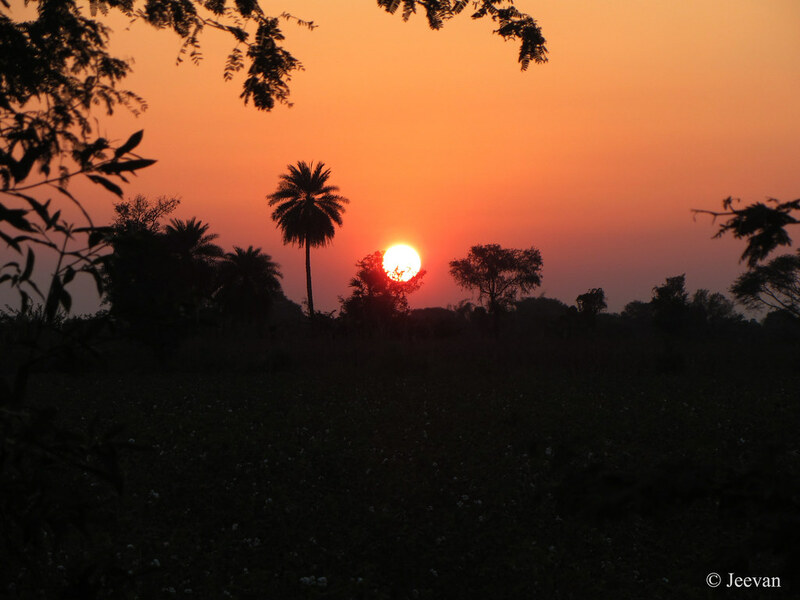 As we are not hurry reaching the place, and we chose Ariyalur just to spend a night before heading to Kumbakonam, the time doesn’t become a matter but experience of nature. This time, even traveling on national highways (NH), I see a difference in sight of scenes which usually seems to be dry and indifferent. The reason for the changes is of course, the late monsoon rain or disaster that flood northern districts of Tamil Nadu. 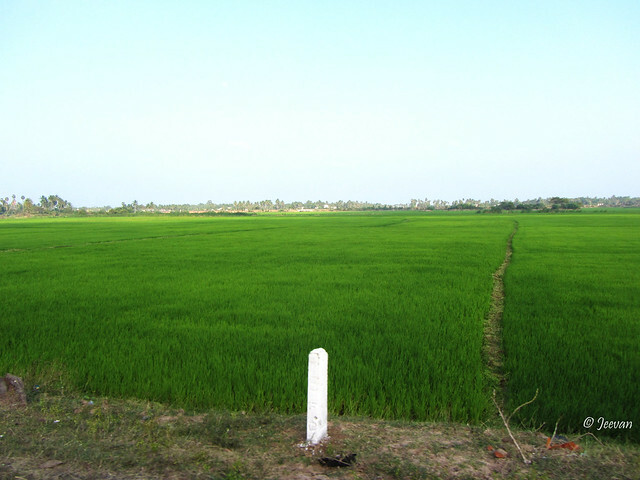 With abundant water in hand (as lakes and ponds are filled), farmers have transformed their farmlands into flourishing lush green paddy fields and vegetable grounds. I could obviously see the landscapes of green everywhere and once we switched from the NH to countryside road, the scenes were enriched with rural essence. As evenfall approached with a brilliant sunset, we scrolled down the windows glass and took gaze at the radiant show while the temperature kneels down to let greet with cool breeze. It’s a pleasure to ride with natural breeze taking on the body, just like the early sunshine that is good for health; the sunset is taken with similar advantage of magnificence. I was amazed at the way sun glows down with great illusion, where branches of trees seem to fall behind the bright sphere. 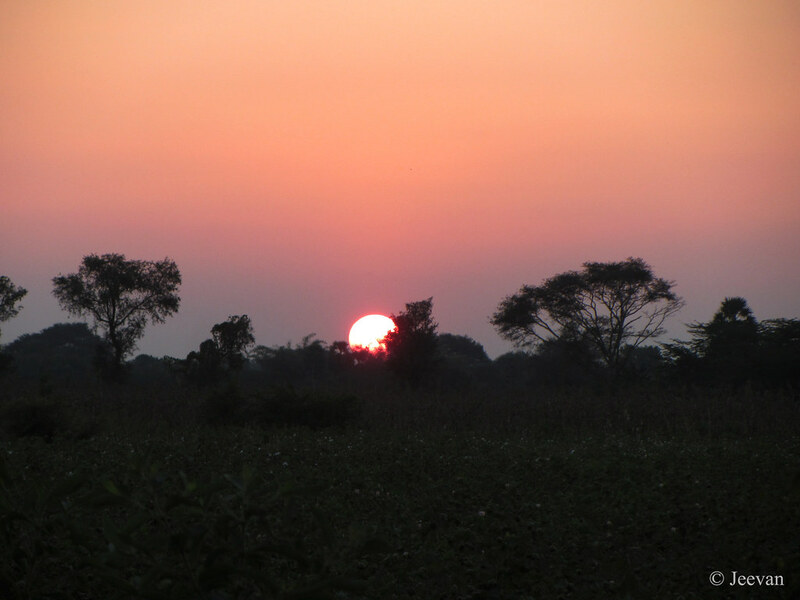 Following the sunset, we stopped for tea at a village tea kadai (shop) and to my surprise the tea tasted good. I love drinking tea/coffee from rural tea shops, as I believed they are made of direct cow milk, but it’s a long back story, because I stopped drinking there as I find its quality become worst in later years. I think, almost places people are using only packet milk and a good tea/coffee is priced high. We reached Ariyalur by late evening and my Google maps navigated us right to the place where rooms where booked for us, without going into the town. 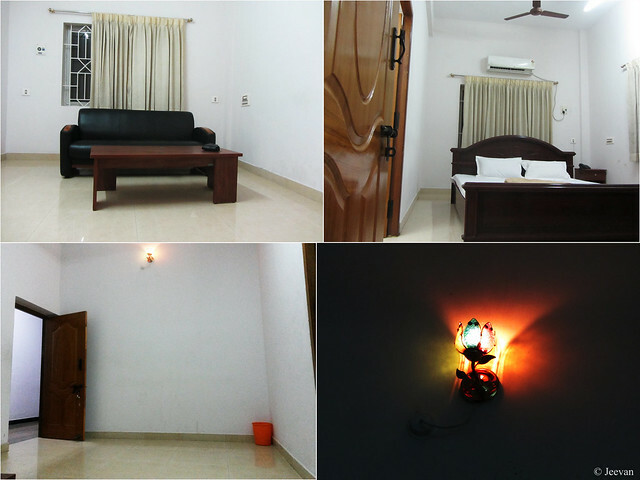 Our cousin brother has booked rooms for us in the tourism guesthouse as it is the only place available to stay and close to Kumbakonam. Behind the beautiful statues in colorful attires that you see in my previous post, there were a dozen emus waiting for us inside an enclosed chain-link fence. 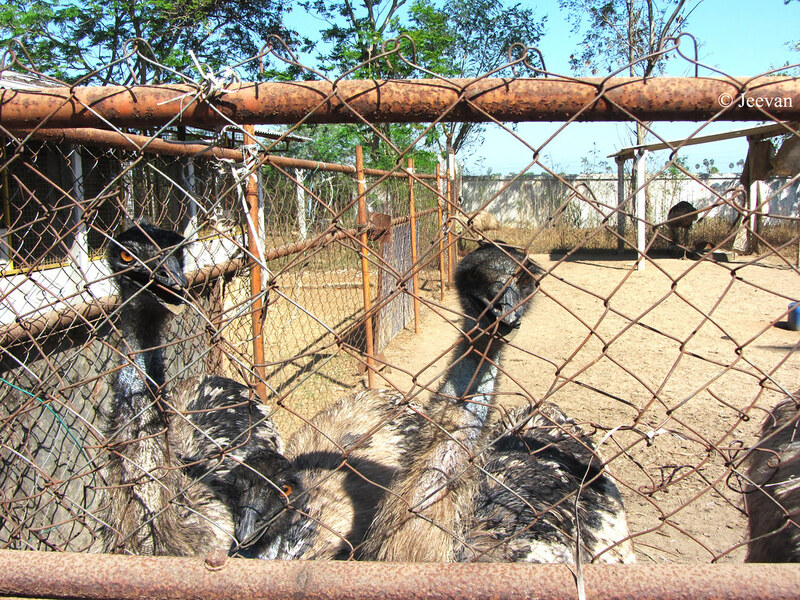 The second largest living birds by height, after its ratite relative, the ostrich, were seen too curious watching at us and the way they raise their heads and peep out from the fence was funnier. Usually it was we; the manner (to peek) in getting a clear picture out of hindrance, but the emus copy with the attitude was really amusing. 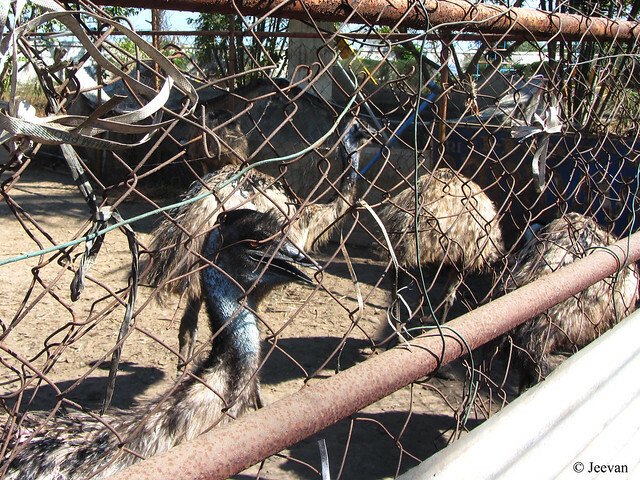 The soft feathered, brown, flightless emus are protected inside a chain-link fence connected with rusted poles. Though it wasn’t inviting and anyone could give a miss to the birds if not observed due to the abandoned park setting around. It was really good to see more emus than the couple of ones we saw in Javadu hills, and they stare at us with great intense and pointed beak could scare anyone. Two weeks back we traveled to Kumbakonam and Ariyalur, on the behalf of my parent’s desire to take dip in Mahamahamkulam (tank) on the occasion of Mahamaham – a Hindu festival celebrated every 12 years in the Mahamaham tank located in the heart of the south Indian temple town Kumanbakonam. Though it was a brief visit to both the towns, I enjoyed the moment of being travelled together as families (along with my uncle’s family) and staying at a place overnight. Actually it was my father who wanted to go to Mahamham and we didn’t like him let go alone so decide to go ahead as a family and planned the trip in a very short time. We took my uncle’s car rather taking our own. Being planned in a time of short span, our car was not ready for a long drive and we were 8 of us travelled in an Innova placing the wheelchair, tightly fixed into boot and couple of bags on lap and between legroom’s. We plan to start our trip at 10 am but were late by 2 hours and had lunch in a restaurant before Mathuranthagam. Named as Balaji Bhavan, has abundance space around the restaurant and parking lot with shelters, gave me a feel of entered a drive-in hotel. Others went in and had their meals and I settle for sambar satham (rice) that was served at car and the taste was somehow enough to eat. But what I liked more was the frontage of an abandon park at the rear of the restaurant. 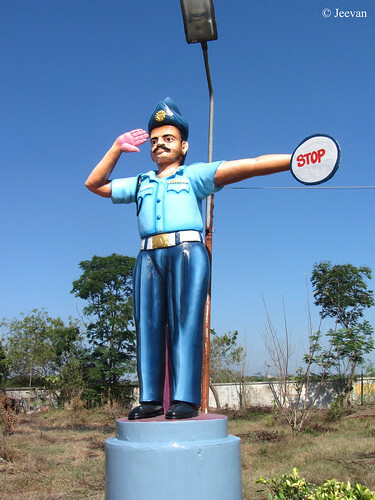 As we enter the restaurant, and drive to the parking, I find a traffic police standing in dark and light blue uniform with a sign of stop and the other hand of salute. At glance anyone would think him a real traffic police man, but it was a statue with exact replica. Following him, there were some women statues representing the different traditional attires of India. 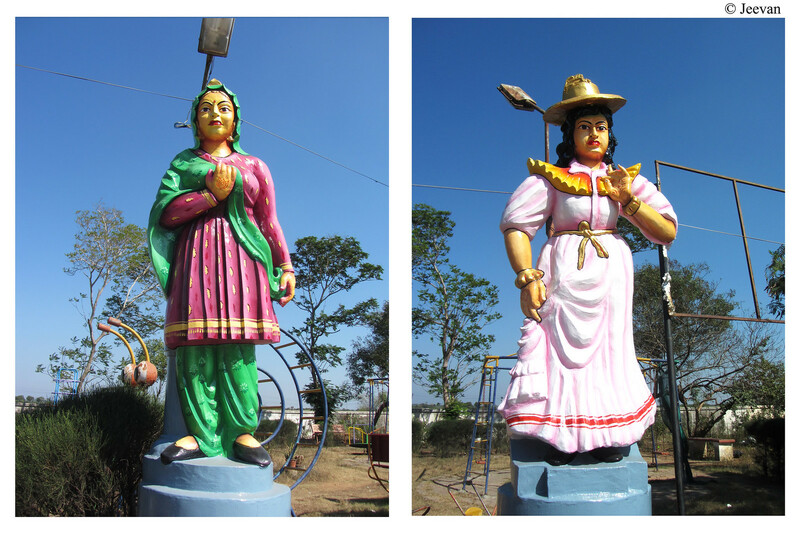 In enriched saris and north Indian salwar, the statues where showy under glowing hot sunshine. But the only woman stature wearing a hat and pinkish gown wasn’t definable. Although I feel the attire resembles Goan style or European tradition. 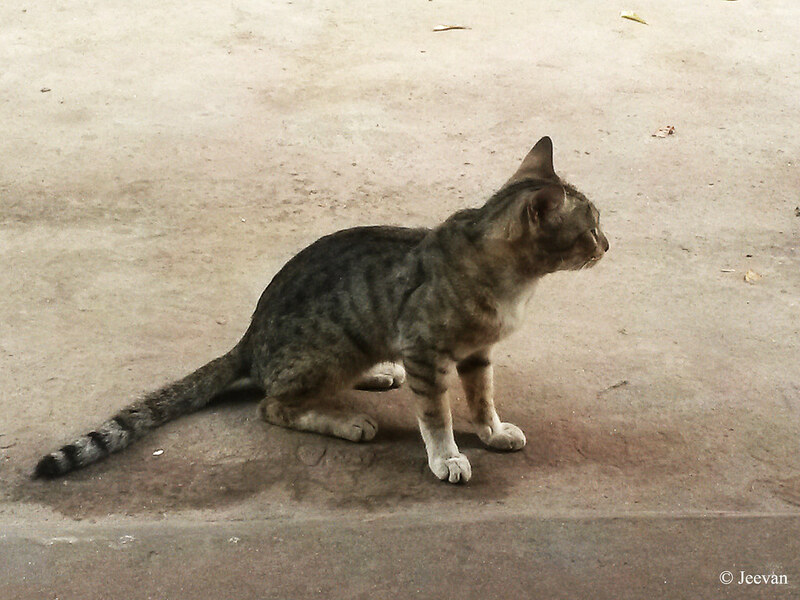 Beyond that there was something to attract me and more in numbers… but I’m postponing it to next post.